We’ve made it to November. It’s hard to believe the holidays are right around the corner. Time has been flying by so quickly. 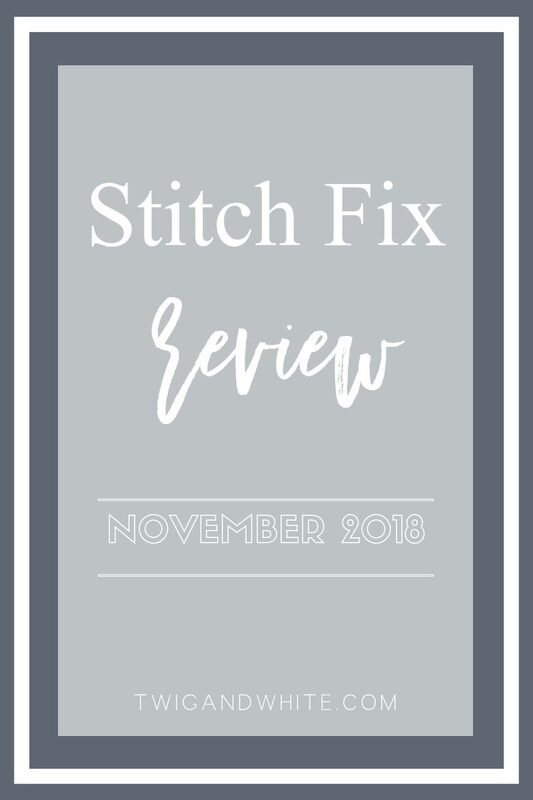 My November Stitch Fix was a fun change from the super casual, athliesure looks of my last couple of fixes. I have a business trip this month and I asked my stylist for some options that are more business casual. I specifically asked for some kind of versatile blazer and a dark pair of jeans and then anything else that she thought would work for me. After almost two years of styling me, my wonderful stylist knows I love stripes. 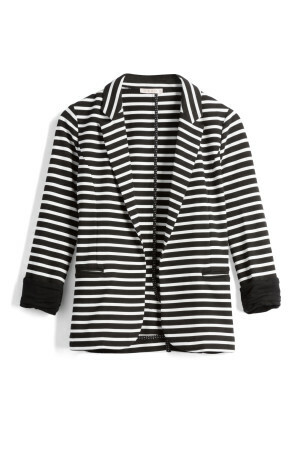 When I first opened my box I was a bit unsure of the striped blazer but when I put it on, it was love at first sight. I’ve since been pinning lots of ideas for how else to wear this beauty because I seriously want to wear it all the time. My stylist sent this top to be worn under the blazer. I’m headed to warmer temps on my trip so she thought a short sleeve blouse would be a good option. This color of this beauty is stunning! The chiffon detail adds just enough to make it feel dressy and not just a tee. The Kerren blouse is way cuter on and in person. It’s a blush pink with kind of a polka-dot pattern. I love the roll-sleeve style because the sleeves can be worn up or down depending on the temps. 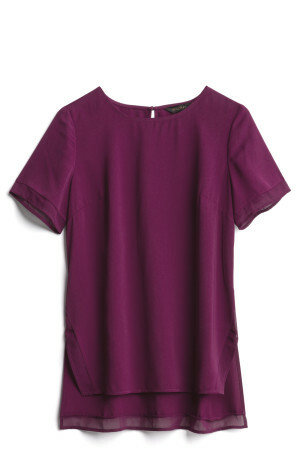 It’s also a great length for a blouse to be worn over skinny jeans. The exact kind of look that feels 100% me. The other two options she sent were a pair of dark skinny jeans by Liverpool and a lovely gold necklace. I failed to capture photos of those two items. Liverpool Jeans have become a favorite of mine. I think I have kept every pair my stylist has ever sent me. The fabric is always incredibly soft with just the right amount of stretch. Once again my Stitch Fix was a success. I added a couple of perfect business casual pieces to my packing list and I’m ready to go. As we move into fall, what pieces are your turning to for every day or is there something on your list that you would love to add to your wardrobe? Leave a comment below and let me know.